We’ve seen John Cena tackle roles that are a bit larger than life, but this one might just be out of this world for some of his fans. Hollywood Reporter has recently posted news that the WWE superstar and actor is currently in negotiations to star in the forthcoming film adaptation for Duke Nukem. The project was initially set up through Dimension Films, but is now being handled by Paramount. Platinum Dunes, which is run by producer Michael Bay alongside Andrew Form and Brad Fuller, is producing the film. 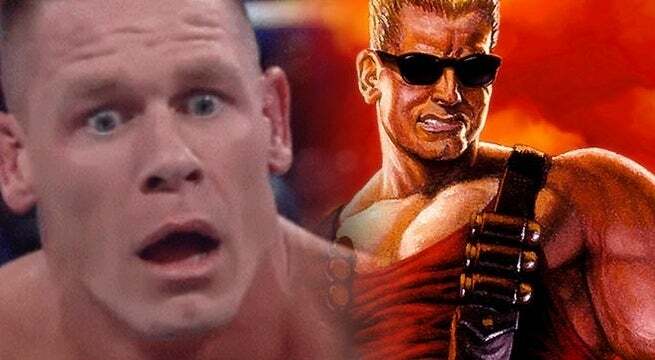 The film is still very early in development, as there’s no writer or director on board yet, but it is reportedly being set up with Cena in mind, no doubt filling the shoes of the politically incorrect superstar from games. Nukem has made a big name for himself in gaming over the past few years. He got his start early, but it was with the first-person shooter Duke Nukem 3D that he truly found his footing, quipping a lot of lines, asking strippers to “shake it, baby!” and shooting alien scum to kingdom come using a variety of weaponry. 2K Games attempted to bring him back in a big way a few years ago with Duke Nukem Forever, though the game didn’t fare that well with fans and critics alike. That said, Nukem remained a relevant name in gaming as of late, mainly thanks to his guest appearance in Bulletstorm: Full Clip Edition as guest star downloadable content. Cena has been appearing in more films as of late, having starring in Daddy’s Home 2 over the holidays, and currently set to appear in the Transformers spinoff Bumblebee, with Bay on board as producer of that vehicle. It’s unknown when he would be setting aside time to film Duke Nukem, but it could likely be set for a 2019/2020 release. He’s…an interesting fit, to say the least. But the question is if people would want to see him in the role. Or, for that matter, what kind of tone the movie would go for. It would definitely have to be an “R”, as a “PG-13” rated film just wouldn’t be Duke Nukem, if we can be honest.